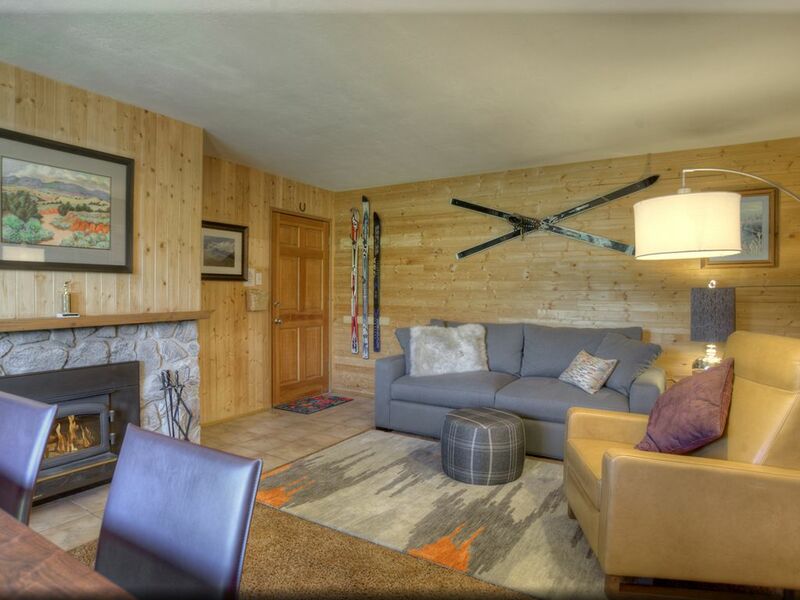 A wonderful year round mountain retreat located within walking distance to the ski lifts at Purgatory Ski Area. This recently updated unit has the feel of a mountain cabin. The townhouse has a bedroom with 2 queen beds and a sleeper in the living room. One full bath with an additional vanity in the bedroom. The bedroom and dining room open to a balcony with views of west Needles mountains. Close by activities include hiking trails, mountain bike trails, fishing, Nordic skiing, horse back riding. Silverton only 25 minutes to the north has an extreme skiing area as well as summer time gold mine tours. Historic Downtown Durango is only minutes away with it's many galleries, shops and restaurants. The perfect place for a vacation any time of year! Colorado sales and lodging tax account number 002866655-001. 1.25, vanity located in bedroom with sink, mirror and cabinet. A pay laundry is located in another building in the Townhome complex. Surface parking lot available. In winter only ONE car allowed and with snow parking is tight. (2) Balcony off of both dining room and bedroom. Great mountain views. A pay laundry is located in another building in the Townhome complex. Consistent with most Colorado mountain resorts, the home does not offer air-conditioning. Most homes are equipped with either a ceiling fan, box fan and at least one opening window to assist with climate control. It was great! Cozy and beautiful view! Cozy perfect and great view! Good location close to Purgatory Resort but there were too many little things that we experienced that will prevent us from booking this location again. The unit was smaller than expected. When using the pull out couch it took up most of the living area. We had 4 in our party and don’t think 6 as listed is really reasonable. Restroom door did not lock, 3 of the 5 remote controls did not work, cooktop smoked when we used it, dishwasher did not fully drain from the last use and was full of murky water. Lamp in the main room did not work. Cuckoo clock was cute but annoying. Dishes and silverware were noticeably dirty, probably because the dishwasher is old and not working properly. Baseboard heater in bedroom works but we ended up turning it off because of the popping and cracking noises throughout the night. Very little storage to stash stuff away during the stay. The water is extremely hard and not until after we booked did they suggest to bring your own drinking water. My wife and daughter decided to forego showers rather than use it. It wasn’t terrible but definitely not updated. Overall not sure if it’s an issue with the owner or manager but would definitely not stay again or recommend. Thank you so much, we really enjoyed the departament in purgatory. Perfect set up for our annual family ski trip during spring break. Condo was well equipped. Only recommendation would be some mattress toppers to add softness, since so many of us sleep on softer beds now. That is the only reason we would not book again at this location everything else was perfect!! New softer beds or toppers added and we will be back - I am admittedly picky if average beds are okay for you then book this one now. Thanks for this feedback, Spenser. You are not the first person to mention this. We are going to either buy mattress toppers or just replace the mattresses altogether. It's important to have comfy beds and a good night's sleep! We are glad that otherwise you had a nice stay in Durango. Update: we hope you come back to enjoy the snow and better sleep. We have purchased new mattresses for both beds!! We came with very little notice and were able to book at the last minute. Nothing terribly fancy, but everything we needed. Price and location can't be beat! We loved everything about Purgatory Ski Resort. And this condo worked perfectly for my boys and I. They could easily walk back and forth from the lifts and restaurants to the condo. We had a terrific stay. Thank you!